After using it a while, I got the knack of lighting and then lighting without a light meter. I was faster, stronger, and smarter. My eyeballs told me whether or not I was on-point with my lighting. And then after teaching a few workshops, I started using my light meter again. Partially because students wanted to learn how to use light meters properly. Hell it's actually attached to my belt right now. But I've been lazy. I'm less situationally aware. I'm less acutely aware of my exposure because I've been relying on my light meter. I've decided. Going forward I am going to officially recommend that photographers ditch their light meters. The problem with the light meter is that it's often used as a crutch for weak lighting knowledge and lack of situational awareness. When you depend on a device to tell you if you've exposed a scene properly, you're relying on a set of numbers rather than your own vision and judgment. That's a slippery slope. Next thing you know, you aren't even thinking anymore. At the end of the day the light meter is just a machine. It can't tell you if you're properly exposed or not. It'll just spit out a set of numbers. You have to determine how to act on that dataset. The problem with most photographers is that we "set-and-forget". We set our lights and then start shooting and neglect the fact that the model is moving, that we're moving, and that everything is therefore dynamic. We think we can shoot hundreds of frames and the light settings will stay the same. And then we forget to check our lighting because our light meters told us everything was "dialed-in". It's a crutch. A poor one at that. With my L-308S I have been lazy about checking my lighting, checking my exposures, and checking my exposure evenness throughout the set. Sure, I am dialed in at the beginning of the set. But by the end of the set, I'm all over the place. Without my light meter, I'd be forced to assess the exposure evenness in the beginning and then also be forced to compare that first frame to the subsequent frames much later. Without a light meter I would be more vigilant about my exposure. Without a light meter my situational awareness would be much sharper. Yes there's a proper way to use your light meter. The problem is that I believe most of us don't use it to our advantage, but rather to our disadvantage. It's a valuable tool no doubt, but it prevents most of us from developing the proper visual sensitivity to exposure. Hence it's a crutch that prevents most photographers from learning how to light properly. And like Forrest, we must ditch the leg braces before we can learn how to run. And then run we shall. Its a tool, nothing more or less. I find that when using multiple lights it helps me get the ratios in the ballpark. I will fine tune on the fly, but a good starting point never hurts. So glad to read this because I've been resistant to relying on a piece of equipment to tell me whether my settings are right or not. I've grown quite comfortable with using my judgment, instinct, and histogram to tell me what tweaks need to be made. You've confirmed what I've suspected all along about this tool! I was thinking of buying a light meter... I've been very hesitant. Maybe I'll continue to be hesitant...lol Great post! Thanks for posting this blog article. I was thinking seriously about getting a light meter but this makes a lot of sense. I'm going to spend time learning lighting instead of shortcutting it with a tool. tools are just tools. they CAN'T prevent you from doing anything. it's your lack of knowing even HOW to use a light meter that is the cause of your frustration, and not the light meter itself. i love how most photographers today blame everything except their own lack of knowledge. making a recommendation to ALL photographers based on lack of knowledge makes no sense. that's like me saying, i don't know how to use photoshop so i recommend ALL photographers uninstall it. a light meter, METERS LIGHT. that's why it's called a light meter. it's not a tool for determining exposure. the only tool that determines exposure is that organ inside your head. therefore, without being able to measure light, your determination of exposure is basically guesswork. perhaps if you actually learned how a light meter works, and what it was purposed for, you would be able to make a more intelligent evaluation. Totally disagree with how you went about this, a light meter is a tool for photographers, albeit professional or amateur, to measure light. This allows the photographer to accurately and quickly control their lights. That's all there is to it. Sure, you'd like to wing it or be acutely aware of what's happening, but when you don't have the time and/or the expertise to pull off a shoot, the light meter is there to help. Doing it through trial and error is totally fine, but in the commercial field, is that really realistic? Even the light gurus still use light meters. 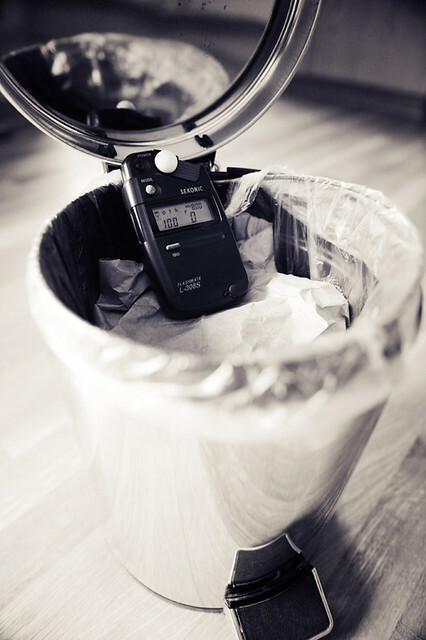 The truth about light meters? Some people hate them en some love it, some of us would never use it, others couldn't leave home without... and i guess i found out why! Do i use it myself all the time? No absolutely not and the more i photograph the less i use it. I will use it at the start of a new setting, just to get an idea about ratio, flash to ambient and that stuff, take some pictures, look at the results and then adjust to my taste, as said before the brain is the tool to give you perfect exposure not a stupid meter that can see the difference between 1/10th stop of light. But there is a problem, some people have absoluty no creative mind and they need a guiding tool to help there brain, some people have no eye for "good" light and will use the light meter to get there "perfect" exposure, they might produce nice & clean pictures but i'm often missing lighting creativity in those results.